Some online store benefits are low investment, offshoring, availability and impact. Your online stores in Madrid with Impulso Tecnológico, specialists in virtual store and Internet catalogue design and creation. If you already have a data base of your products, we can do the import work to the new system. Some benefits of online stores are low investment, offshoring, availability and the impact they can have. 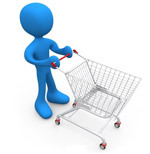 The store system we prefer to use is Prestashop, you can see a store demo. Keep in mind that the aspect and functionality are entirely configurable. We like this system because apart from being open-sourced, it allows us a complete personalization. It also has a large community of developers and a very extensive implementation in stores worldwide. Increased turnover for your business through internet sales. The trend also has a margin of growth. Your competition probably already has one or is developing one. Now is the ideal time for electronic commerce. Internet sale figures are now interesting and will continue to rise. It will now cost less money and resources to occupy important positions in your sales sector than what it will cost in a year. Every passing moment counts. It gives your business prestige and a professional image. Knowing that a real store offers its products online gives a professional image and prestige. It will cost you very little to make use of the connection between an online store and a real one. Low and accessible costs. Starting an internet business is very cheap when compared to the real world. I can tell you from experience, after starting several traditional businesses and realizing that expenses add up quickly. The store or business is open 24 hours a day in the whole world. Without schedule or geographic limits. Your clients can be thousands of kilometers away, on the other side of the world. Online stationary and object store, tremendously personalized for children and adults. Online instrument catalogue for industrial process automation.